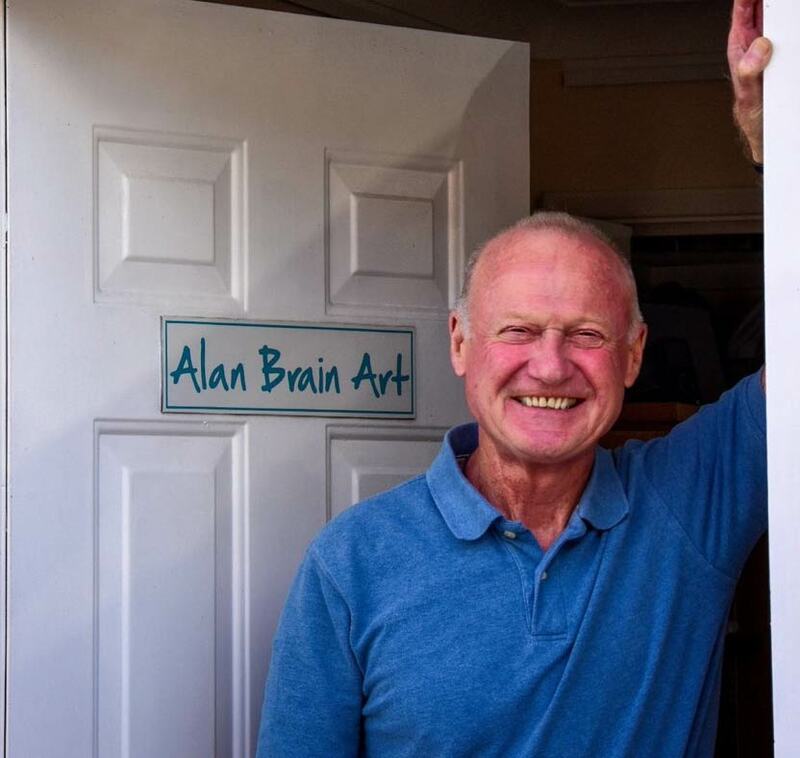 Alan Brain artist and Art Tutor - maker of authentic art. They call me an abstract artist (which I am) but I am also described as a surrealist (not sure that is a complement) and a geometric expressionist. I don't really want a box, I just paint my way. My paintings are "visible feelings" along my journey of self-discovery. They express the passions which have moulded me into who I am. It is an exciting and disturbing journey, that's okay in fact it's brilliant! I need to express what I care deeply about so that I can see it for myself, painting is my way to do that, I can't put it into words. The paintings converse with me as I work, I see my passion unfolding, they reveal more about me than I thought I knew. Sharing these visible feelings with others is my reward, I love it when someone connects with a piece, it is a spur to do more and more. I use vibrant or muted colour, unusual abstract shapes, anything to say what I want to say, there is no holding back. Solitude, loneliness and abandonment emerged early in my work inspired by the desert, large empty buildings and deserted places. My love of the natural world, my curiosity about human relationships and the draw of large simple structures have all fuelled my artistic journey. Recently I have been compelled to explore my hatred of war, in particular The Great War and its lasting impact on ordinary people like myself. I have much more to do. I always abstract and use anything to make my mark. I am never satisfied until the paintings say what I want them to say. Typically I use vibrant colour with strong geometric shapes to create the feeling I want to create but I love to experiment and anything goes as long as it works. I love it when someone engages with my artwork to explore their own emotional reaction. To me there is nothing more satisfying than to create something that makes folk want to pause and wonder. I hope they are a little richer when they move on. My paintings are owned by private collectors in UK, Australia, USA Canada and Europe. English Surrey artists paint traditional English watercolours, so it is thought. I don't. I use watercolour very differently to what is expected. I guess I love to be different. 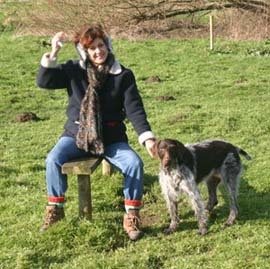 When I am not painting I am likely to be walking my dog Charlie and I am probably thinking about painting. Or I may be trying to play golf and looking forward to a beer with lunch after the game. It led to a change of direction that I have never regretted. Today, painting is my passion. I find inspiration from within myself and my artwork is driven by my life’s experiences. Such as flying... as a pilot the sky and the weather with its ever changing moods fascinates me, as does the vast open space and amazing colours. The sense of quiet calmness that can be felt in a large building or in a wide flat open area excites me – obviously this comes from too much time spent in hangers and airfields! Or escaping from the stress of the office... I ran a demanding business for some years and learnt to value the time I could spend alone. Time to think, consider and just be. This love of quietness, solitude, is probably within all my artwork but this is tempered with something else, I am not sure what it is but it is something to do with that threat to my quiet time. I must keep looking. There is more to do! That "certain feeling" which I have captured only in part, drives me to explore, to seek it out and to express it in paint if I can. The challenge and reward are irressistable. That is why I paint. It has taken over from flying and my business world. And I love it! Alan Brain is a contemporary abstract artist and art teacher working in Highcliffe Dorset England. He creates abstract and semi abstract paintings that are individual powerful, and always personal. He has been an art teacher for several years and has run his course/workshop "Painting with Feeling" all over the UK. Personal tuition - one to one - is available at his gallery studio.